For the past decade there have been various animated hits that have brought viewers into sprawling fantasy and sci-fi worlds, introducing them to overly absurd characters and storylines. Craig of the Creek bucks this trend with some heartfelt, down-to-earth adventures. Growing up in the '90s I was exposed to loads of classic cartoon offerings. There were the over-the-top antics and slapstick humour of Dexter's Lab, Johnny Bravo, and the PowerPuff Girls on Cartoon Network, the more grounded adventures of Rugrats, Doug, and Rocket Power on Nickelodeon, and a weekly dose of superhero slugfests to look forward to on Fox Kids. I probably watched a few too many hours trying to keep up with all my favourite shows. The one animated program that I really fell in love with was Hey Arnold!, which premiered on Nickelodeon in the fall of 1996. Even though I lived far away from Arnold's big city setting, there was a very personal connection to the daily struggles and successes portrayed in the show. 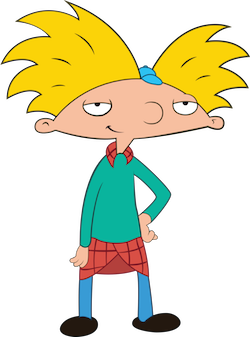 Arnold was a smart and thoughtful protagonist with some wacky friends and neighbours, a far cry from the overly moronic and irrational main characters that dominated many of the other popular cartoons of the time. But it wasn't like Hey Arnold! was dull. 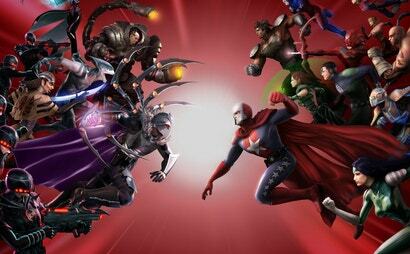 There were plenty of silly plots and crazy supporting cast to make episodes interesting and also relatable. It was a finely tuned mix of humour and reality that resonated with me, and I'm sure others, for many years. 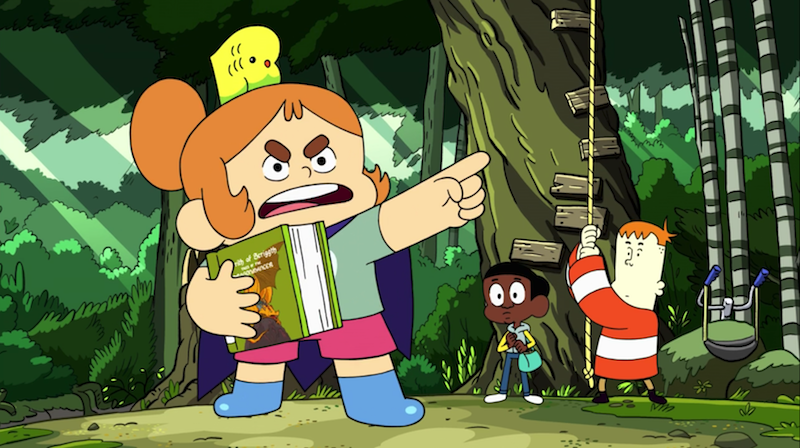 Cartoon Network's newest show, Craig of the Creek, has found a similar niche and could very well become the Hey Arnold! for a new generation of viewers. 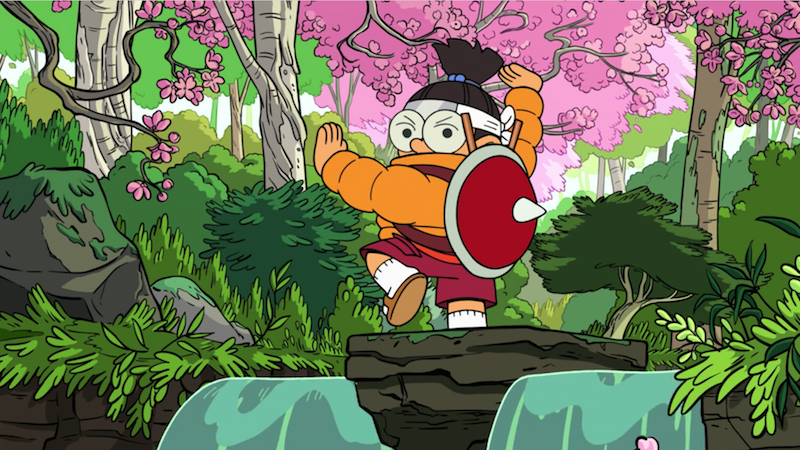 Series creators Matt Burnett and Ben Levin, who worked together as writers on Steven Universe, have done an excellent job of crafting a world where kids are simply being kids. 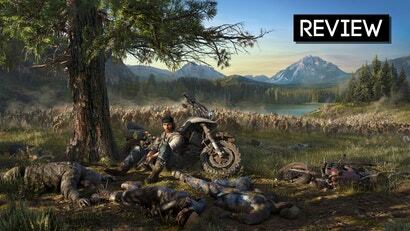 The titular Craig lives with his family in the suburbs of the fictional Herkleston and, as one might guess, is obsessed with the creek that winds through the wilderness behind his neighbourhood. Craig is a doer, a fixer, a map maker. He is always planning traps, drawing up blueprints, and attempting to solve his friend's issues. He's a kindhearted boy, doing his best to help others, but also falling prey to the normal insecurities and desires that come with being ten years old. Alongside Craig are his trusty companions, Kelsey and JP. Caped warrior of the forest, Kelsey fancies herself the lead in her own fantasy epic, even going so far as to internally narrate her ramblings of heroism and woe. JP serves as a comedic foil, a sweet but dimwitted everyman who's down for any adventure, no matter how dirty or dangerous. With Craig leading the way they're a solid and likable trio, and none of their personalities get tiring over the course of a normal 11-minute episode. Within the confines of the creek are what can best be described as "tribes" of other children with similar tastes. There's the high and mighty boy scouts, a horse-loving pack of girls, the dirt bike kids, and a band of young Japanophiles who preside over "The Ninja Garden." As someone who grew up with these kind of cliques, and now teaches 11 and 12 year-olds for a living, I can tell you that, as silly as they sound, these groupings are certainly a real thing. Though the show may take these obsessions and personas to a slightly exaggerated extreme, they're surprisingly genuine. Unlike many cartoons with boorish fathers, flighty mothers, and cruel siblings, Craig of the Creek portrays at least an attempt at normal family values and believable interactions. That isn't to say there's not some conflict here and there, especially from Craig's older brother Bernard, it's just refreshing to see an animated family that tries to sit down for a meal and talk through their feelings. Cartoon parents and relatives are often made out to be the bad guys, or even just incompetent hurdles for the main character to overcome. Real families have their high and low points, their strengths and weaknesses, and all those aspects are present in Craig's world. Like Steven Universe before it, Craig of the Creek seems like it may be dipping its toes into some more mature themes, such as race, sexual orientation, divorce, and socioeconomic status, down the line. The series certainly hasn't led with anything so bold, but the show runners have slipped in various subtle nods to such controversial topics. Craig's spunky grandmother speaks of fighting for equality during the civil rights movement, stating "There was a lot going on back in those days. There's a lot going on right now." Two teenage goth girls walk off hand in hand after a heartfelt conversation about their future. Kelsey speaks openly of spending time with her single father, whereas JP is shown to live in a messy, run down house, where he lives with his grown-up sister and mother. It's just little things here and there that make the show that much more special and relatable for kids of different backgrounds. 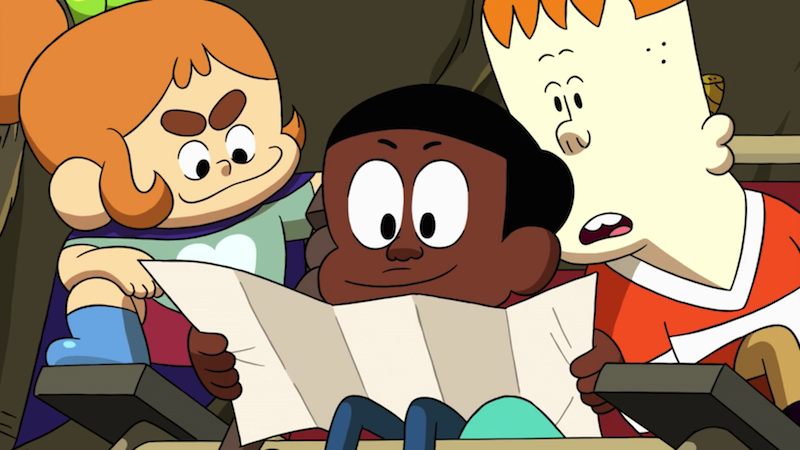 When it comes to the main trials and tribulations of each episode, Craig of the Creek does its best to keep things focused on a kid's perspective. There's no saving the world or battling evil, just over due library books to return, muddy pants to wash, and what to do with that turtle you just found by the stump. Some of the shows exploits stride a bit further beyond the realm of reality than others, but that's to be expected from any cartoon. My favourite episode to date is an homage to trading card games like Magic: The Gathering and Yu-Gi-Oh called "Bring Out your Beast." It's a hilariously accurate representation of what it's like to try and get into a new gaming scene when you know none of the rules or strategy involved. Craig begging his older brother to teach him the rules of this monster battling card game, and then stealing his brother's old cards when he refuses, really hits close to home for me. I've been on both sides of that situation with my own brothers, and it never ended well. It's funny how such a simple an silly premise can connect so well with a viewer, but that kind of connection is certainly the show's greatest strength. Craig of the Creek has only been on the air for around a month. In that time Cartoon Network has premiered fourteen episodes, and made most of them available for viewing via their dedicated app. There's still much we don't know about various creek kids, family members, pets, and locations. As someone who enjoyed scavenging through the woods behind his own backyard as a child, I truly hope Craig and company get the chance to keep exploring and expanding their own little world for at least a few seasons.